Nurse volunteers: Do you sign "RN"? This section worries me! Even though you are licensed to perform tasks out of the scope of a layman volunteer, you are not covered by the hospital's malpractice insurance. Please be very careful about the tasks you choose, and good luck with your job hunt. I don't believe the link between economics and poor diet is that clearcut. I see many of these very same people with multiple electronic gadgets, hundred dollar cable bills, etc.. I think that education can still have a huge impact on helping families prioritize. You can still eat and live healthy on a tight budget. During my most impoverished period (starving student) I walked LOTS and ate 2-3 small, but mostly healthy meals. Couldn't afford cheetos and the other snacks I see provided daily to school children. Nutrition to prevent and treat pressure ulcers??? Nursing School while still working? I went to nursing school in my early 30's, and still managed to work full time. It's very do-able. There will be many people and esp instructors that will warn you how tough school and clinicals are. They will tell you that you cannot work at all. While this may be true for some students, it isn't universal. Nursing school is difficult and time consuming. What it really requires us determination. I hit many obstacles while in NS (husband had spinal surgery which put him out of work, lost our cars and home, I worked fulltime, then he moved 300 miles away for work without me, etc..) I maintained a b average and stayed determined to succeed. I also stayed away from the negative students. Starting your career in nursing is a great idea. Your age really isn't much of a factor, you will see all ages in school. Understand that it will take you several years to complete. You must finish pre reqs, apply and then there is the waiting list before you can even tackle the two years of NS. If you already have a college degree, there are better routes than getting your ADN, so be sure to do your research first! Good luck! Nursing while nursing, can it be done?? Congrats on your baby and new job! Try not to stress so much for the sake of your baby and your breastmilk. Your employer is legally obligated to allow you time to pump (at least here in ca). Even if you pump just 10 minutes 2 or 3 times during your shift it will really make a huge difference. I'm so sorry you lost your supply but you can still keep breastfeeding if that is your wish. Remember, your baby goes through periods of needing,more or less milk and your body has always adjusted. If your baby needs more milj after you get home from work, your body will tune into that. You are a great mom trying to provide for your baby and family. Don't feel guilty for going to work, you are a great mom! Perhaps you need to research these med errors and find out what factors are involved so you know what needs to change. Are they happening at certain times of day, do they not match the original md order, is the nurse drawing up the wrong ml's, are mess being missed, are the incorrect dosages being prescribed, etc... Try to have a third-party handle the research, font penalize nurses for the errors or you may have difficulty gaining their honesty and participation. Sitting down to calm an upset patient is unprofessional? Yes, next time shove a xanax down her throat and take away her call- light! *** sarcasm over.. your supervisor is either over-stressed and not thinking straight or an idiot. Shhhh! ---It's all a crock! It is very important to keep the floor as quiet and calm as possible. Imagine how you feel when you are sick at home and people won't leave you alone. Stress from extra light and noise do prolong healing time and increase risk for complications. For nicu babies, they can pop a lung from noise stress or get a fabulous brain bleed. I doubt anyone expects you to whisper during a code, but yelling down the hallway rarely brings them back to life either. You did not do "nothing" for your pt. You were there for them and supported their right to choose quality of life over quantity. Your coworkers is seriously confused. Refusing medication (o2 is a med) is not suicide, its a legal and ethical right. Who are we to decide what is best for someone else's life? We are there to make sure they understand the consequences of their actions. It is always difficult to see someone die, or to start their journey. It is emotionally draining, but know that you have made the right decision to advocate for them in life and in death. As someone already pointed out, your posts sound defensive. I would also add that you accuse allnurses of causing you to second guess yourself. Not so. You are an adult, no one is forcing you to click on the negative posts. There are plenty others to choose from. You say you know that you want to be a nurse, you don't need the approval of all the nurses on here. You will never get that in any profession. Set your goals and keep your head forward, you can succeed and love being a nurse. Just remember that you decide on your success and happiness. Am I waisting my time with associates degree? I too, already had a Bachelor's before entering an ADN program. I would not call it a 'waste' as I am an RN making the same, and performing the same duties as BSN nurses. However, it was only after I was halfway through the program that I discovered I could have gotten my Master's degree in nearly the same amount of time. Please take some time to look at the direct entry Master's programs out there. You will become an RN during the program, and complete a MSN in about 3 years. I really wish I had known, I would have jumped at that chance. If I go back now, it will still take me another 3 years for a Masters. I had plantar fasciatis while in nursing school, working full-time and walking was my only mode of transportation: Try icing your feet a couple of times a day, you can wear heel splints at night, always wear supportive shoes and buy new ones when the old ones get too stretched out, stretch your feet as much as possible, and keep off of them whenever you can! Good luck! Why doesn't the nursing profession support LPNs? The LTC i work at is the exact opposite. They want all the RNs to move on and want to hire only LVN/LPN (less pay). 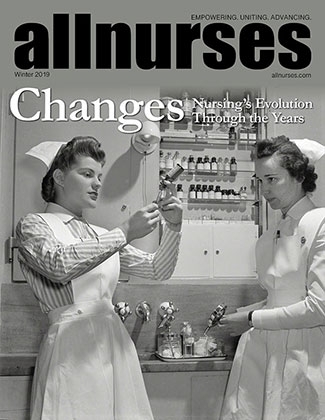 So, RNs are being phased out! This is an often asked question, and unfortunately, one that no one can give a concrete answer to. It really depends on your state and on the particular facility. Many facilities do not want the liability of an RN working as a CNA. Nor to they want the temptation of staff using you as an RN while working as a CNA. However, I know that in the bay area, there are many foreign trained RNs and Physicians working as CNA's in LTC while they pass their boards here. So, you may want to try LTC or even Doctor's offices who would gladly hire you as an office MA for less pay than RNs make. ETA: If the facility is unionized, I would say the answer would most certainly be 'no', IMO.